This page also serves as an addendum/particularization of our Terms of Service. It is critical that this page be read carefully and in its entirety so that there is no confusion about what you are purchasing. By placing an order you are entering into a legally binding arrangement and are certifying that you have read & understood the items on this page. If you have a question please contact us, we’re happy to help! As Succinctly As Possible, Can You Explain To Me What You're Going To Do For My Website? With our Complete WordPress Speed Optimization service, we test multiple optimization configurations, find out what works best for your unique website; then, construct a performance architecture that will make it as fast as it can possibly be — for everyone, everywhere, at all times, thereby providing your site’s users with an optimal user experience. This performance architecture will be robust, self-maintaining, self-evolving and as automatic as is possible. We optimize specifically for the real-world, user-centric performance metrics that Google themselves recommend optimizing for so that you can stop worrying about your site’s performance and move on with the business of publishing content. With our Economy service, we investigate, find and fix the primary front-end performance issue we find for your site, whatever that issue might be. Our Economy service will not result in the fastest possible version of your site but will give you better real-world results than all of our competition’s best services. Will You Be Changing How My Website Looks Or Functions? Nope. What we do is make your website as fast as it can possibly be. We do not make any changes to your website’s aesthetics or functionality. Can You Optimize My Site? | How Much Faster Will My Site End Up? | What Can You Do For My Site? If your website is self-hosted and uses WordPress — yes, we can optimize it. It is not possible for us to know how much faster your site will end up without doing the work, unfortunately. Indeed, 95% of what our service is, is figuring out how much faster your site can be as it is currently built, with the remaining 5% being the actual implementation of the performance architecture we devise to make it as fast as it can be. That said, 98% of the websites we work on are made at least twice as fast; and, once your Complete WordPress Speed Optimization project is complete, it will be impossible for your site to be any faster without the removal of functionality or without it being rebuilt (in other words, without making your site a different site). I.) Google.com feels REALLY fast, right? But do you know how long it takes Google.com to reach Fully Loaded status on a real desktop computer over an actual cable connection…? And that’s Google! But you perceive Google to be much faster than this, don’t you… more on this in a moment. A site’s ‘Load Time’ on Pingdom (especially) is in no way, shape or form indicative of what your — or any — site’s users are experiencing in the real world. Even when Pingdom’s ‘Load Time’ results are bad they are nonetheless favorable; which of course means that the smallest amount of optimization skews the results even more positively. Pingdom is a nice tool from which to get generic best practices recommendations; but, it’s ‘Load Time’ metric is entirely synthetic, does not correlate with reality in any way, and — if you genuinely care about what’s actually happening for your site’s users — should be disregarded literally 100% of the time. That ‘Load Time’ as indicated by layperson-centric tools such as Pingdom and GTmetrix is not only wildly inaccurate, but has the uninitiated chasing an illusory pseudo-metric that doesn’t indicate anything at all meaningful about a website, is common knowledge amongst adepts of the Website Performance Community… We are going to repeat that: It is common knowledge amongst adepts of the Website Performance Community. — So, when someone attempts to sell you on Pingdom or GTmetrix ‘Load’ results only one of three things is happening: a.) they are either lying outright, b.) omitting critical, substantive information to manipulate you, or, c.) they do not know what they are talking about. The unvarnished truth about ‘Load Time’ is this: of the various Load Time metrics that exist, none of them matter at all unless they are so long as to be a problem for how fast your website’s users perceive your website to be. And that’s if — and only if — we’re talking about real Load Time metrics (how long it really takes for Google to reach Fully Loaded on a real device, on a real network, as one example). Don’t feel like watching a 40 minute video? Read this. So, bottom line: what ultimately matters? What do your site’s real, human users want? What does Google want? As we have alluded to above: Perceived Speed — optimization of the user-centric performance metrics that combine to form how fast your site’s users think your site is. And that’s what we do! And — Most Importantly — Google’s Speed Index. It is precisely the performance metrics that we optimize for that Google actually uses in their Search algorithms to assay and ultimately determine your site’s performance and user experience. Do You Guarantee Better Grades On/Optimize For Tools Like PageSpeed Insights/GTmetrix/Pingdom (Etc) | How Do You Test My Site's Speed? No. In fact, we do not use this class of tools at all. As professional performance developers, we simply do not need and therefore do not use them. To learn more about what our service is and does, please take the time to read our homepage and this FAQ completely so that there is no confusion about what you are purchasing. We are all but certain to improve your website’s scores on PageSpeed Insights and improve your site’s grades on other such tools with our Complete WordPress Speed Optimization service. Doing so, however, is not what we guarantee nor is doing so the purpose of our service. The purpose of our Complete Optimization service is optimal real-world performance for your site’s real, human users as your website is currently built, not necessarily better grades/scores on PageSpeed Insights or any other similarly purposed tool. A website’s grades or scores on such tools and it’s real-world performance averages can be — and nearly always are — two different things. The mythology surrounding PageSpeed Insights — particularly the mythology that PageSpeed Insights scores have something to do with how a website ranks in Search or that PageSpeed Insights grades are somehow indicating how fast or slow one’s site is for the average real-world user — has yet to fully abate and misunderstandings still abound. What GTmetrix, themselves, have to say about their tool. Tools like PageSpeed Insights (Pingdom, GTmetrix, Think With Google, etc) are what are referred to as general “Best Practices” tools. They exist primarily to provide suggestions, generally to the layperson who would otherwise have little to no idea what to investigate when it comes to website performance optimization. As tools they have their place and we do indeed implement all best practices that are possible to implement when you order Complete Optimization; but, these tools cannot ‘know’ which of their recommendations are ultimately actionable or even for the best. Further, all Best Practices tools are in some way synthetic and/or purposefully oversimplify the nature of performance optimization for ease of use by the layperson, can (and usually do) produce false-positives, do not tell one how fast one’s site is perceived to be by real people; and, are not intended to provide accurate, actual, real-world performance diagnostic metrics as they apply to your unique site and it’s unique, real-world traffic patterns. Simply put: These tools are not ends in themselves; real-world performance is. PageSpeed Insights is an “Emulator”. 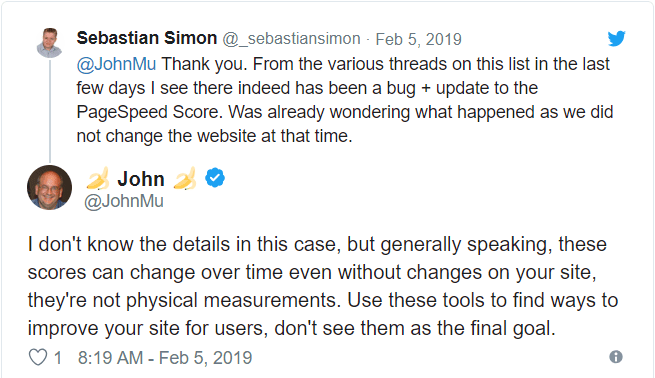 As John Mu of Google explains in the above tweet, it is simply a tool, not and end in itself. As initially noted, a site’s grades on Best Practices tools and its actual, real-world performance are often two different things. Indeed, it is even possible for your website to get considerably faster in real life but score worse on Best Practices tools; or, score higher on such tools and end up with a site that is considerably slower in real life if not completely broken. Google themselves allude to this with the verbiage they now employ when one runs a test with the tool. In short, correlation is not causation; and, just as a high score does not guarantee a faster site, a lower score does not guarantee a slow or slower one. Simply put, scores on tools such as PageSpeed Insights, etc, while they can be helpful if interpreted accurately, are not, in themselves, completely representative of real-world user experience. PageSpeed Insights’ now uses “Lighthouse” to create the “Speed Score”. This is an emulation (read: artificial) and suffers the same Achilles heel as all best practices suggestions tools: it cannot tell you which of it’s recommendations are actionable as your site is currently built. Further, PageSpeed Insights/Lighthouse is focusing on emulated Time to Interactive, SpeedIndex and First Contentful Paint metrics – not what these are in reality – on a very throttled 3G moto g4/nexus 5 mobile device. Lastly, any actual real-world performance data (i.e. “Field Data”) offered by PageSpeed Insights is garnered from the Chrome User Experience Report, inclusion into which, given the criteria that must be met, we estimate at less than 1% of an average site’s traffic; ergo, this data, while factual, is unrepresentative by definition. Since real-world performance is what matters (to assist one in bettering this is, after all, why Best Practices tools exist in the first place), WpFASTER optimizes for the real human beings visiting your website, not an arbitrary grade/score that, absent a complete rebuild of your site from the ground up or the removal of a significant amount of mission-critical functionality, may be impossible for your website to achieve. As described on our homepage, we concentrate on real-world, user-experience-centered performance metrics that Best Practices tools don’t analyze because that’s not what they are for. It is precisely the performance metrics that we optimize for that Google actually uses in their Search algorithms to assay and ultimately determine your site’s performance and user experience. For testing purposes, we primarily use Google developer tools, our own in-house tools and worldwide network of real, human users. Should you choose Enhanced Reporting when ordering, you will be provided with real before-and-after performance benchmarks garnered by way of Google’s own real-world performance optimization testing platform Webpagetest.org, so that you have an independent, objective, empirical means by which to verify the improvements we report. As succinctly as we know how to put it: Best Practices tools are simply that — tools. They are not ends in themselves, whereas how your site actually performs for it’s real, human users is. Optimizing primarily for better grades on best practices suggestions tools, instead of primarily for one’s actual users, is like hanging a picture on the wall not for the picture, but for the hammer that was used to help one hang it. WE DO NOT REBUILD WEBSITES FOR BETTER SCORES ON BEST PRACTICES TOOLS. We optimize sites in the iteration they are given to us to do so. Fielding post-project, hypothetical, what-if-we-remove-or-change-‘x’ inquires is not part of our service. Beyond this FAQ, educating clients on how to use, accurately interpret or rebuild a website to comply with the recommendations made by their preferred best practices suggestion tool is also not included with our service. Since grades/scores on Best Practices tools are not what WpFASTER does or sells, post-project complaints about grades/scores on Best Practices tools going down, remaining the same, or not going as high as one had hoped they might will in all likelihood not be responded to. Since grades/scores on Best Practices tools are not what WpFASTER does or sells, grades/scores on Best Practices tools going down, remaining the same, or not going as high as one had hoped they might are not grounds for a refund. If what you are primarily looking for is better grades/scores on Best Practices tools, not the fastest possible version of your website for your website’s actual users, WpFASTER is not what you are looking for and you should not place the order. If you order anyway, you are not entitled to a refund in the event that the scores on your preferred best practices suggestions tool do not end up where you think they should be upon project completion. Should I Go With Complete Optimization Or The Economy Service? We very highly recommend you only ever pick Economy if you are unconcerned with post-project support (since it does not come with any) and are okay with us being the sole arbiters of what your site’s primary front-end performance issue is. Further, Complete Optimization is always the best value, even if you have had someone optimize your website in the past, have optimized it yourself, or genuinely believe you only need some specific optimization performed. With Complete Optimization, we implement every conceivable best practice possible. We further re-work your site’s entire performance architecture to be a lean, mean, speed machine; and, introduce custom fine-tuning that can only be found with WpFASTER’s Complete WordPress Speed Optimization service. In short, once your Complete WordPress Optimization project is complete it will literally be impossible for your website to be any faster. We do understand, however, that budgetary constraints can be a factor. In such instances, our Economy service is for you. Note: our Economy service is not an à la carte option. If you include in your order notes a request for a specific thing you want done it will be assumed to be and taken as a suggestion. If we do not find that which was suggested to be the site’s primary performance problem, or, if it’s not something that enters the orbit of what we do (i.e. front-end optimization), it will not be done. 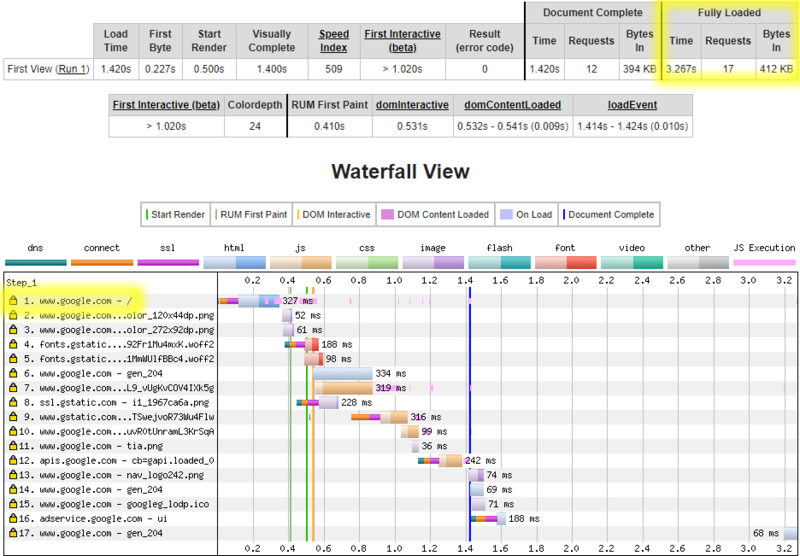 If you are looking for some specific thing and only that thing to be looked into — not what we determine to be the site’s primary (front-end) performance issue — WpFASTER is not what you are looking for. If you order anyway, not getting the specific thing done you had suggested we do is not grounds for a refund. What Information Will You Need From Me In Order To Implement My Site's New Performance Architecture? Administrator-level WordPress login credentials (username and password). If applicable to your project: Domain registrar login credentials (login URL, username and password). If applicable to your project: Hosting account login credentials (username and password). If applicable to your project and if you have cPanel: cPanel login credentials (username and password). If applicable to your project and if you have cPanel with WHM: WHM login credentials (login URL, username and password). If applicable to your project: (S)FTP login credentials (host, username, password and port). If applicable to your project: CloudFlare (or Sucuri, etc) login credentials (username and password). If applicable to your project: Secondary CDN (e.g. MaxCDN) login credentials (username and password). Note: All credentials you provide to us are deleted from our server upon project completion. Once your project is completed, you are encouraged to change any passwords you have provided to us. Before providing us with the login credentials we request, please make sure to test them to make sure they work. If you send us login credentials that do not work your project will be delayed by at least one business day; and, if you did not elect Expedited or Rush delivery, will likely return your project to the back of our project queue. Needing some or all of the above credentials is standard fare. These would be something needed by any company, entity or person you would be interested in having perform pretty much any sort of development work for your website. You are our client, our principal and our contact: communicating with anyone other than you about getting the credentials we request is not part of our service. Again, we request only what we need to make your website as fast as it can possibly be, we do not need anything we do not specifically ask for. Login credentials will be requested once via your Order Confirmation email and if they are not provided after they are initially requested we will assume you have no intention of providing them. Debating the merits of why we have requested the logins we have and/or explanations of why we have requested the logins we have requested is not part of our service. Please do not send us what you feel are equivalent substitutions for the logins we request in your Order Confirmation email: explaining why any login substitutions you provide are not what we need is also not part of our service and exits the orbit of the support we provide. Refusal or inability to provide us the login credentials we request in your Order Confirmation email, or at any point while your project is in process, automatically renders a project ineligible for refund/our guarantee. The sale is final, even if we were, through no fault of our own, unable to install, in full or in part, the performance architecture we have devised for your site. Further, our service is analogous to ordering a custom cake from a bakery. Once you order your ‘cake’, we make it then notify you that it’s done (via your Order Confirmation email). If you no longer want your cake after we make it that is of course up to you; however, we are now stuck with a cake that we cannot give to anyone else. As such, refusal or inability to provide us the login credentials we request in your Order Confirmation email, or at any point while your project is in process, automatically renders a project ineligible for refund/our guarantee. The sale is final, even if we were, through no fault of our own, unable to install, in full or in part, the performance architecture we have devised for your site. By ordering you are agreeing to these terms. Who Will Have Access to the Login Credentials I Am Providing You? Sam or Marcus, WpFASTER’s Project Management Leads only. Under certain conditions, AJ, WpFASTER’s Managing Partner, may need access to these credentials too. All credentials you provide us are deleted from our server upon project completion. Once your project is completed, you are further encouraged to change any passwords you provide us. Is There Anything You Do On Every Project That I Need To Know About? Any and/or all optimization-related plugins you have installed may be replaced or removed. By placing an order you are authorizing their replacement or removal. Unless you reject our recommendation for it, we also use CloudFlare (free version) on every Complete WordPress Speed Optimization project. If you are not currently making use of CloudFlare you will need to open a CloudFlare account and transfer your nameservers to theirs. Doing so is easy, straightforward and painless, but we are happy to do this for you if you prefer: Just choose that option when making your selections on the order form. We should note, the additional features offered for the paid version ($20/month for the ‘Pro’ account) are well worth the money. So, if the expense is justifiable, we do recommend a paid CloudFlare account. We can open but cannot set up a paid account for you, though, you will need to do this. Regardless of whether or not you choose the free or paid version of CloudFlare, however, if you are purchasing Complete WordPress Speed Optimization (or CloudFlare Installation and Configuration as an À La Carte option), we (or you, if applicable) will be changing your current nameservers to CloudFlare’s, which is necessary to receive all of the benefits CloudFlare has to offer. 1.) If you are using Sucuri, Sitelock, Amazon/Amazon Cloudfront we cannot implement CloudFlare. If, when ordering, you elect for us to implement CloudFlare and are using one of these (or a similar service), you must remove it from your site. If it is still active at the time we confirm your order, the CloudFlare fee paid will instead be applied to testing and optimal configuration of your existing Security/CDN service. 2.) If your website is using an EV or OV SSL certificate (these are the types of SSL certificates that typically display a company’s name in the browser bar, not just a green lock), we can open your CloudFlare account, optimally configure your CloudFlare settings for you and even change your nameservers. But, before we can change your nameservers, you will need to first upgrade your CloudFlare account to the “Business” plan (or greater), and upload the EV or OV SSL certificate to your CloudFlare account yourself. EV and OV SSL certificates require a “Business” CloudFlare account (or higher). Business accounts are $200 per month, “Enterprise” accounts are considerably more. If you have elected CloudFlare with your order (but were unaware of this CloudFlare requirement for EV and OV SSL certificates before placing your order), and would prefer to not have CloudFlare due to these prices, we are happy to refund the CloudFlare set up fee. 3.) If you are using Office for business, Office 365 Admin, Office 365 Small Business, Office 365 Small Business Admin or Microsoft 365 Business, we will set up and optimally configure CloudFlare for you if CloudFlare is elected with the order; but, configuring your Office account to work with CloudFlare is not part of our service — you will need to configure your Office account to work properly with CloudFlare, including changing your website’s nameservers to those CloudFlare assigns. If you are using any of these Microsoft products you must make us aware that you are; otherwise, your email may go down if we implement CloudFlare without you telling us that one of these email products is in use. How do I add DNS records for Microsoft Office 365, Lync, or Exchange Online? I Don't Want CloudFlare Because 'X'. Can I Order Complete Optimization Without It? Of course! But, not allowing us to implement CloudFlare is by definition a special restriction and will render your project ineligible for our guarantee as your site will not end up as fast as it otherwise would have, even if you are using some other CDN (MaxCDN, etc) or something like Sucuri. If you do not want CloudFlare, please select “No, thank you” when you get to the “Do We Need to Setup Your CloudFlare Account?” portion of the order form. I Want X, Y, and Z Done/I Have A List Of Things I Want Implemented. Is WpFASTER For Me? We do not work off of client-provided lists, no. If you tell us not to do something we’re definitely not going to do it. However, if you tell us you want some specific thing done and it is not – in our sole opinion – advantageous or actionable for your site, it is not going to be done (at least not by us). Our clients hire us for our 500+ years of combined website optimization experience and because they want to leverage that expertise to make their websites as fast as they can possibly be. So, if what you are looking for is someone to implement a ‘To Do’ optimization list or if you want some specific thing and only that thing done, we are not what you want and you should not place the order. I Want My Theme And/Or My Plugins Analyzed To See If There Are Better Options. Is This Something You Do? We do not perform such an analysis. Once you order, we work off of the assumption that your website is fully developed and everything you have installed is mission-critical for the UX (User Experience) and functionality you are after. The only plugins we may remove or replace will be performance-related. That said, if something is found to be broken in some way or found to be the source of conflicts, we will indeed let you know. You have been sent an automated email of your receipt/invoice from wordpress@wpfaster.org, so be sure to check your SPAM folder for that if it didn’t go to your inbox. If it has been more than 24 of our business hours (Monday – Friday, 7:00 a.m. to 5:00 p.m., Eastern Standard Time) — not clock hours — since you’ve ordered and you’ve yet to receive an Order Confirmation email from your Project Manager, please check your SPAM folder and be sure to add support@wpfaster.org to your email’s contacts or you might not receive our correspondences to your inbox. Please also be sure to fill out the “Secondary Email Address” portion of the order form when ordering; this email address should be a standard Gmail, Outlook, Hotmail, Yahoo! (etc) email address, not associated with your website/domain/server. If after 2 (two) business days we receive no response to your Order Confirmation email, your Order Confirmation email will be forwarded to the secondary email address you provide on the order form. I'm Sending You Emails But Not Getting A Response/Only Some Of My Emails Get Responded To. What Gives? We promise, we respond to all inquires from currently active and recently active clients no matter what. So, please check your SPAM folder and be sure to add support@wpfaster.org to your email’s contacts or you might not receive our correspondences to your inbox. If you have done this and are still not receiving our responses, you almost certainly have a DNS issue, an SMTP issue, or, a misconfiguration of your server-side email SPAM filter. If you are a currently or recently active client and not receiving our responses (or are only receiving some of our responses), please try contacting us from a standard Gmail, Outlook, Hotmail, Yahoo! (etc) email address, not associated with your website/domain/server. What Host Do You Use And Recommend? Siteground’s Cloud service! But even Siteground’s GrowBig and GoGeek plans are superior to most other hosts’ VPSs, VDS’s or Cloud services and perfectly acceptable if your site is not a business or eCommerce site. Siteground will migrate your site for free (the process is all very hassle- and stress-free); and, should you purchase your new Siteground account through either of the above links, we’re happy to optimize all performance-related aspects of your new Siteground account as part of your optimization project at no additional charge. How Long Does This Take? | When Will Implementation Begin? | When Will You Be Finished? Economy service is generally completed within 24 business hours (but this is not guaranteed). For Complete Optimization, how long it will take is relative to just how much we will need to communicate with you over the course of the project; and, if Expedited or Rush Delivery is not purchased, your project’s position in our queue. If you select Regular delivery with your order, we do not provide (or guarantee) any time frames other than to say the amount of time it will take to begin and complete implementation of the performance architecture we have devised for your website will be relative and reasonable. By selecting Regular delivery with your order you are indicating that you are okay with this and understand that you are not entitled to an implementation start or end date, estimated or otherwise, and that one will not be provided. Even Expedited or Rush Delivery, however, might experience delays if changes are requested mid-project or things arise that are outside of our control. In the event that we are not able to meet the Expedited or Rush Delivery project completion guarantee (3-business-days and 1-business-day from the date of Order Confirmation completion, respectively) , and we are squarely at fault, this fee will be refunded to you. We reserve the right to define when this has occurred and by placing an order you agree to these terms. What About WordPress/Plugin/Theme Updates? | What If I Change My Site? | Does My Purchase Include Post-Project Support? The performance optimization architecture we implement will be designed to be self-evolving and self-maintaining. As such, it will last indefinitely. If you’ve purchased Complete WordPress Speed Optimization, you are entitled to free, post-project support for 1 calendar month past your date of purchase in the event that the project meets all conditions for free post-project support. Issues with plugin updates that seem to not work with the performance architecture we have implemented. Issues with theme updates that seem to not work with the performance architecture we have implemented. Issues with WordPress updates that seem to not work with the performance architecture we have implemented. If you make changes to your site that invalidate the structure of the optimization work we have performed you will need to repurchase Complete Optimization. If you were to change your theme or have development performed for your site after we complete our work, as two examples; if you in any way alter the performance architecture we have implemented as another. If you make a valid support request you will be asked for a comprehensive description of any and all changes that have been made to your website since your project was completed. If you are unable or unwilling to provide this, it is highly unlikely that we will be able to provide diagnostic support, at least not for free. In order for a project to be eligible for any post-project support (free or paid, i.e. Extended) beyond 3 (three) calendar days from the time stamp on your Project Completion email, the project site must be running the latest version of WordPress with all installed plugins and the theme it is using up to date at the time the project begins. If the project site is not running the latest version of WordPress and/or some installed plugins and/or the theme it is using are not up to date at the time the project begins, you have 3 (three) calendar days from the time stamp on your Project Completion email to report any anomalies you believe to be caused by the performance architecture we have implemented; after 3 calendar days, should we choose to attempt to investigate the issue, you will be charged a minimum $100 USD diagnostic fee for us to investigate. Project sites that are not running the latest version of WordPress and/or some installed plugins and/or the theme they are using are not up to date at the time the project begins otherwise come with no guarantee, warranty, right to refund or (free) post-project support. If you elect Extended support and the project site is not running the latest version of WordPress and/or some installed plugins and/or the theme it is using are not up to date at the time the project begins, the Extended support fee will be used to cover the the cost of the first post-project inquiry/diagnostic. Should you never require post-project diagnostic support, the Extended support fee, if paid, is non-refundable. If you do not wish to run the most current versions of your theme, plugins and/or WordPress but wish to have at least one post-project support inquiry/diagnostic covered or want a bit of post-project insurance, you are encouraged to purchase Extended support. Doing this will immediately place your post-project inquiry/diagnostic, should you need one, in our priority response queue as we will then not have to wait on payment to attend to the issue should an issue arise. Optimization for websites not fully launched/under development are ineligible for support, free or paid. You have 3 (three) calendar days from the time stamp on your Project Completion email to report any anomalies you believe to be caused by the performance architecture we have implemented; after 3 calendar days, should we choose to attempt to investigate the issue, you will be charged a minimum $100 USD diagnostic fee for us to investigate. Any support beyond these things is at our discretion. By ordering, you are agreeing to this arrangement. Will My Site be Optimized on Mobiles/High Latency Devices? If you purchase our Complete Optimization Service and are showing the full, desktop version of your site to users of mobiles and other high latency devices (like tablets), then yes — it will be as optimized as it can possibly be. Are You Performing the Work On My Live Website? Yes and no. First (prior to even confirming your order), we clone your site and insert it into a testing environment, thereby enabling us to do A/B testing with no potential for disruption to your live website. 95%+ of the of the project is actually done in this testing environment. However, once we feel we have everything dialed-in, we do have to implement the changes on your live website, which constitutes ~5% of the project. Is There Potential for Disruption to My Live Website? From the work we do via the testing environment, no. From the implementation of the changes we need to make to your live site so as to make it as fast as it can be, yes. Please don’t let this startle you. Disruptions are likely to be very brief; and, far more often than not, will translate to nothing more than your website being slower for a moment. Indeed, your site’s visitors are unlikely to notice them at all even if they are technically happening. By placing an order you are indicating that you understand that disruptions to your live website are possible; we recommend you pause any ad campaigns you have running while implementation of your website’s new performance architecture is underway. Why Can't You Figure Everything Out With the Cloned Site? There are certain (as well as unpredictable) idiosyncrasies of the live environment that either do not exist, or cannot be known to exist, until we implement the changes on the live website. In other words, a seamless integration of the changes we will make in the testing environment is not possible as some of these changes will need to be ‘tweaked’ in the live environment to achieve the fastest website possible. Is There Any Potential for My Website or Aspects of it to Break? With our type of development, the chances are exceedingly slim, but yes. Downtime is possible when you have any sort of development work done for your website. We should note, however, that our work cannot cause issues, per se, but can reveal latent, already-present issues. There are literally billions of variables at play. While the outcomes of most of what we will implement are predictable, some are not. If your website is making use of a poorly coded theme, some questionable plugins, has had shoddy development performed, has a mis- or mal-configured server or file system (etc) this increases the chance of outages. Fear not. Almost always, a website going down can be immediately remedied and returned to normal. We simply backtrack and reverse the implemented change that was the culprit and/or consult with you about the already extant issue with your site that is the actual root of the problem. Should downtime occur, you are, in virtue of placing an order, agreeing that our diagnosis, whatever that diagnosis may be, is accurate. You further agree to assist us, should we require assistance, in implementing a solution; and, that your website, or aspects of it, ‘breaking’ does not ipso facto entitle you to a refund. We also recommend you pause any ad campaigns you have running while implementation of your website’s new performance architecture is underway. Should I Make a Backup Of My Website Before You Begin? Yes. Making a backup prior to making any changes to your website, or having changes made, is very highly recommend and basic best practices. Once you have submitted the information requested in the Order Confirmation email sent to you by your Project Manager, we will assume that you have a backup of your website at the ready and that you will be making daily backups over the course of the project in the off chance that it needs to be restored. Should your website need to be restored, you are responsible for implementing the backup. You are, in virtue of placing an order, agreeing that should you need to implement a backup/restoration that this does not ipso facto entitle you to a refund. Do You Do Any Work On My Website's Server/Database/Back End/Etc.? | What DON'T You Do? What you are purchasing is front end optimization, i.e. 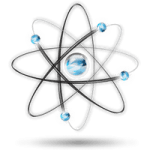 optimization of the site itself as it appears and applies to users who do not need to log in; not the server, the database, WP Admin area or the speed of uncacheable pages for logged in users (or, more generally, the speed of anything that is entirely or almost entirely determined by the quality of the site’s hosting environment) etc, which would be back end optimization. 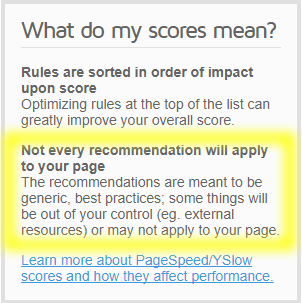 Optimize for better grades/scores on PageSpeed Insights, Pingdom, GTmetrix, etc. and the like. This list is not exhaustive, but a general illustration of the things that exit the orbit of our front-end optimization services. You wanting us to do these things or things like them and us not doing them is not grounds for a refund, even if we were, through no fault of our own, ultimately unable to implement your site’s new performance architecture. As a rule of thumb: if something does not directly and logically pertain to the real-world performance of your website, in the exact state your site was given to us to optimize and as it appears and applies to users who do not need to log in, it is not something we do. If you or your site’s users are having performance issues while logged in, your site is on the wrong hosting and the issues you are experiencing will not and cannot be remedied until and unless the site is migrated to a proper hosting environment. Please see “What Host Do You Use And Recommend?” above for our hosting recommendations. I Have Had Custom Development Done for My Website/A Developer Built It For Me. Is This An Issue? WpFASTER follows best practices and standards set out by WordPress and the Website Performance community. As such, if your developer’s customizations are well coded and following best practices and WordPress standards, no, there won’t be any issues. If issues do arise, however, you are, in virtue of placing an order, agreeing that our assay of your developer’s contributions, whatever that assay may be, is accurate; and, that our primary recommendation will be to refer you back to your (or another) developer to re-code things such that they are in compliance with the performance architecture we implement/best practices and WordPress standards. You further agree that – if issues do arise – your website or some aspect of it ‘breaking’ as a result of your developer’s contributions, after having implemented your site’s performance optimization architecture, does not entitle you to a refund. If assuming this risk bothers you, you should not place the order. Do You Work On Sites Hosted On WP Engine, Flywheel, Kinsta (Or Some Other Restrictive Hosting Platform)? We do, but such projects are automatically ineligible for refund/our guarantee even if we were, through no fault of our own, unable to actually implement your site’s new performance architecture. Project sites hosted on restrictive hosting platforms (i.e. hosts like WP Engine, FlyWheel, Kinsta etc. that disallow caching plugins, for example) are ineligible for refund/our guarantee primarily because they limit our ability to fully optimize your website or do so in a way that is fine-tuned for your particular website’s needs. Such projects are also ineligible for free ongoing support. Since WP Engine makes use of MaxCDN, we do not implement CloudFlare. We reserve the right to define “restrictive”. If assuming this risk bothers you, you should not place the order. If you don’t know whether or not you are hosting your site on a restrictive platform, please contact us before placing the order. Do You Work On Sites That Are Not Fully Launched, In Development, In A Development Environment/Staging Area, Etc? For an additional fee of $100 USD we do, but such projects are automatically ineligible for refund/our guarantee even if we were, through no fault of our own, unable to actually implement your site’s new performance architecture. Such projects are also ineligible for post-project support, free or Extended. If Extended Support is purchased for such projects, that fee will be used to cover the fee for sites that are not fully launched, in development, in a development environment/staging area (etc). Enhanced Reporting is generally not possible for sites in this situation (but may be, so please contact us prior to ordering with Enhanced Reporting so we can see if it is possible. If you order Enhanced Reporting without letting us know that you will be developing the site’s front-end or back-end while we work, the Enhanced Reporting fee is non-refundable in the event that Enhanced Reporting is not possible to provide). You have 3 (three) calendar days from the time stamp on your Project Completion email to report any anomalies you believe to be caused by the performance architecture we have implemented; after 3 calendar days, should we elect to investigate the issue, you will be charged a minimum $100 USD diagnostic fee for us to investigate. After 3 (three) calendar days from the time stamp on your Project Completion email, we reserve the right to refuse to perform any further work on your project site. We offer NO post-project support for issues that may arise if you try to push the changes we make to your development site to your live, production site. Ideally, performance optimization is done when a site is launch-/production ready and/or fully iterated. We very highly recommend you only have us work on your development site if you have someone on staff that is capable of reverse engineering what we do and adept at clarifying any anomalies that may arise if/when attempting to push the site live. If assuming this risk bothers you, you should not place the order or should have us implement the new performance architecture directly on your live, production site. Do You Work On Sites That Are In Multisite Installations/Networks? Generally, yes. Please contact us prior to ordering so that we can have a look at your network and how you have it set up. If you place an order for a website that is part of a multisite network without first contacting us, and we are, for whatever reason, unable to implement the performance architecture we have devised for that site, you are not entitled to a refund. Unless you place an order for each individual site in your multisite network, we will implement a performance architecture that works with all of the sites in your network. Note: this may not result in each individual site ending up as fast as it can possibly be. If you have a multisite network and want each and every site in it to have it’s own, best possible performance architecture, you must order for each individual property. I Have Lots Of Ads/3rd Party Resources On My Site. Can You Make Them Faster? Ads/3rd party resources (things used by your site but not actually served from your server) cannot, themselves, be made faster, no, since we cannot access the server from which they are being served. But! — making your website and everything actually served from your server as fast as it can possibly be will make ads/3rd party resources begin and therefore end their loading sooner, which gives your site a net performance gain. During What Hours Is Support Available/What Are Your Hours Of Operation? Monday through Friday, 7:00 a.m. to 5:00 p.m., Eastern Standard Time (no weekends, no U.S national holidays). Orders may be confirmed on weekends; but, implementation of your site’s new performance architecture will not begin or take place outside of our standard support/operating hours. What Do I Get With Enhanced Reporting That I Do Not With Basic? Basic reporting is pretty much just what it sounds like: We notify you when implementation is complete and provide you with a summary of what was done; and, we explain any special instructions that you need to know moving forward. Enhanced reporting includes all this; plus, detailed before and after metrics for every single resource or asset that makes your site what it is, before and after video, various charts and graphs granularly detailing the improvements made, project notations, recommendations and the like. In short, every possible thing you could want or need to know about how our work has affected your site. Neither of these modes of reporting includes training on how to do what we do. If you want/need before-and-after metrics, you must select Enhanced Reporting when ordering. If you do not select Enhanced Reporting, you are in no way entitled to a refund when before-and-after metrics are not supplied to you. If you do not order Enhanced Reporting, you are taking our word for it as regards improvements and agreeing to do so by placing an order. If you order Enhanced Reporting and we are unable to provide you with it through no fault of our own the Enhanced Reporting fee is non-refundable. I Would Like To Talk To Someone On The Phone/Via Skype (Etc). Is This Possible? Unless you are subscribed to our Optimization Concierge Services, sorry, no. We are otherwise entirely web-based, which keeps Support staff lean and prices low. If you’re worried about email responsiveness issues, we assure you — don’t. If you have a question or issue while your project is in process, your Project Manager will respond to your inquiry quickly, usually within moments of your sending the correspondence if the correspondence is critical in nature. Support’s average response time is 1 business hour. If you would like to learn more about our Optimization Concierge Services, please contact us. Before contacting us, however, please note that our Optimization Concierge Services begin at $1K (USD) per month and require a minimum 6 (six) month commitment, paid in full up-front. I/We Have A Contract/MNDA (etc) That We'll Need Someone To Sign. Is This An Issue? Mutual Non-Disclosure Agreements are almost always fine. For contracts: It depends on the nature of the contract. If the contract is, in our judgement, purposefully vague, unnecessarily convoluted; or, requires a relinquishing of WpFASTER’s rights as a service provider (or otherwise impedes our ability to perform our best work), it’s not a partnership we would be interested in entering. For review by the Managing Partner and Legal, please contact us with any contracts you will need signed prior to placing an order . What Are The Details Of Your Guarantee/Refund Policy? We are so confident in our Complete WordPress Speed Optimization Service that if we fail to improve your website’s real-world performance you not only get your money back, you get it back 110% (i.e. the purchase price plus 10%). If your project is eligible for refund/our guarantee, you have 3 days (72 hours) from the date and time stamp on the Project Completion email sent to you to request your money back. After you receive your Project Completion email and we were unable to improve your site’s real-world performance. THE SALE IS OTHERWISE FINAL, EVEN IF WE WERE, THROUGH NO FAULT OF OUR OWN, UNABLE TO IMPLEMENT THE PERFORMANCE ARCHITECTURE WE HAVE DEVISED FOR YOUR WEBSITE. Please note: By the time we request logins via your Order Confirmation email, your project has already been completed with the only thing left to do being implementation of the performance architecture we have devised. If you wish to cancel your order at any time after we have requested login credentials, but before you receive your Project Completion email, even if we were, through no fault of our own, unable to implement your site’s new performance architecture, your project’s purchase price is not refundable, the sale is final. Our service is analogous to ordering a custom cake from a bakery. Once you order your ‘cake’, we make it then notify you that it’s done (via your Order Confirmation email). If you no longer want your cake after we make it that is of course up to you; however, we are now stuck with a cake that we cannot give to anyone else. No longer wanting the cake you ordered does not mean you get your money back for the cake we spent time and resources making. Economy projects, sites hosted on restrictive hosting platforms (see above) and sites residing in a development/testing environment are ineligible by default. If you change the site we are to optimize at any point after you order the project is ineligible by default. If we find your site’s hosting to be part of the problem and we recommend a more appropriate host/hosting environment and you do not take our advice, the project is ineligible for refund/our guarantee. Communication: If we send you a correspondence and you do not reply within 30 calendar days or we are unable to complete your project within 30 calendar days of your order date through no fault of our own, your purchase price will be converted into a Project Monitoring and Maintenance fee and you will lose your right to refund even if we have yet to begin implementation of your site’s new performance architecture. At which point, if you would like us to resume your project, you will need to repurchase an optimization package. These are non-negotiable. As such, if you have any questions about our guarantee/refund policy, please contact us before placing the order. My Month Of Free Support/3 Months Of Extended Support Has Expired But I Need Help. What Can I Do? Please contact us or reply to your project completion email with a description of the issue. What Do I do If I Have a Question That's Not Answered Here? Contact us. We’re happy to help! How’s this work? What’s it cost?